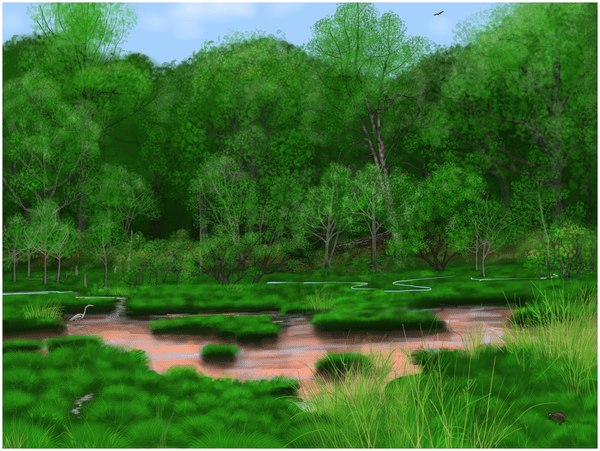 A study out this week has reconstructed an image of what one area of pre-European forest looked like in the North American area of what is now Pennsylvania. From this artist’s interpretation, at least from a distance, it looks like, well, like a forest. But prior to European settlers’ intensified land clearing, the mill-building, the agriculture and industry, the trees were different trees, by and large, and entire waterways and ecosystems were very different. There are several mill dam reconstruction projects underway, and it is hoped that gaining a more profound understanding of the pre-settlement forest and waterways will support those efforts. Many of the trees that were present still exist, but in different ratios and different places. Some of the species, like the American chestnut, have since died out due to disease. In a poignant irony of paleohistory, one of the very mill dams that led to the changes in the forest system was the reason researchers were able to study its characteristics. The fossilized leaves that would offer an in-depth picture of bygone forest trees are typically not easy to find. But researchers examining the effects of mill dams on water levels and waterways made a find of leaf fossils from hardwood trees that was preserved in a layer of pre-dam river mud. It might otherwise have been long since washed away – but it was buried under a layer of sediment from the construction of a mill dam 300 years ago.